It’s that time of year again. The time when Cyberlink releases the latest version of its venerable and powerful software video/multimedia player, PowerDVD ($100 MSRP, available as a download or physical disc at Amazon). The big news this time around is media-casting support, so you can stream audio and video to Apple TV, Roku, and Chromecast devices on your network. On the audio side of the coin, the news is support for high-resolution DSD (Direct Stream Digital) audio files. PowerDVD’s new 10-foot interface (for use with a remote from that distance), is clean and intuitive. You can switch back to the regular interface at any time. Those are all great improvements, but why would you need something like PowerDVD when there are plenty of free players out there, such as Windows Media Player/Movies & TV, Media Player Classic - Home Cinema, VLC, and others? Two words: Blu-ray and quality. 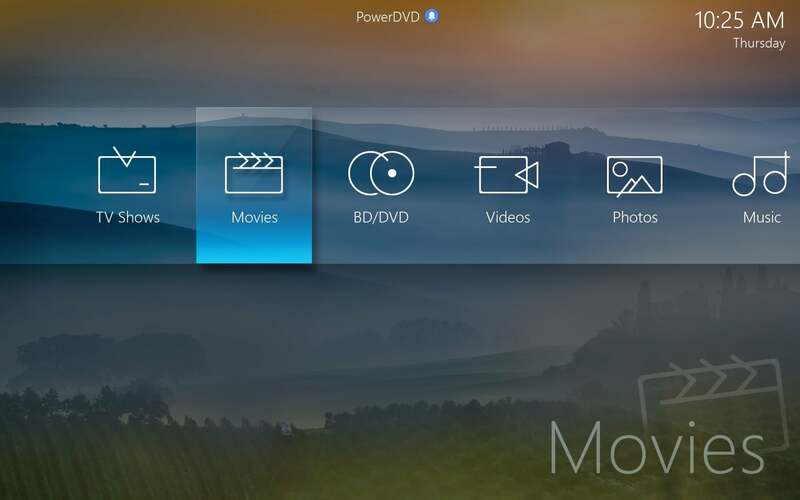 PowerDVD is one of the only Windows programs that can play Blu-ray discs, including 3D Blu-ray. The only other major title that I’m aware of is Corel’s WinDVD 11 (also available as a download from Amazon, for $60). For those of us who have moved beyond optical media for movie delivery (it remains great archival media), the video and audio enhancements that Cyberlink builds into PowerDVD make movies look and sound a lot better. Amazingly so in some cases, such as with older movies and TV shows. I use all the players, but when I really want to view movies at the best possible quality, I pull out PowerDVD. 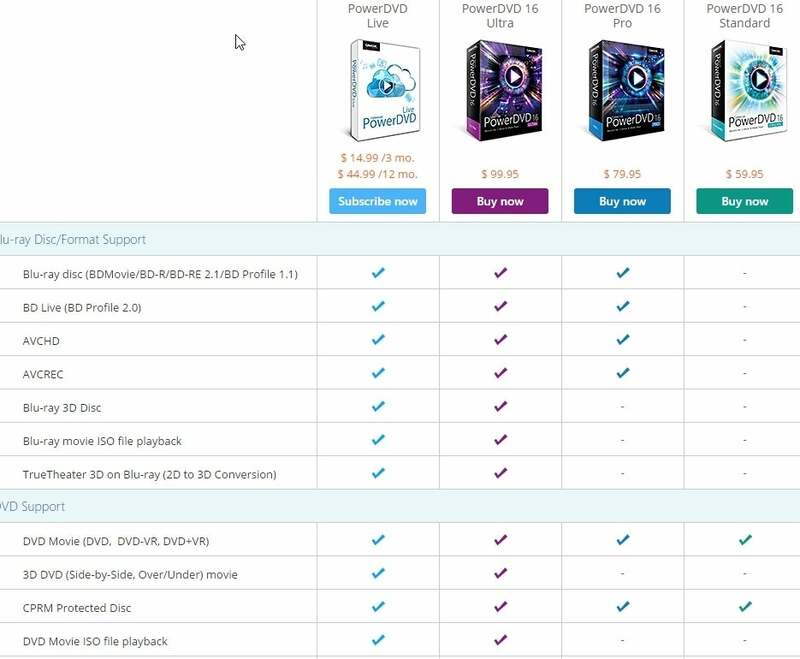 PowerDVD licenses lots of technology. Note that there are three versions of PowerDVD: the $100 Ultra, the $80 Pro, and the $50 Standard. There are a host of differences between these SKUs (see below or the full comparison chart at Cyberlink.com), but only Ultra and Pro can handle Blue-ray, and only Ultra handles 3D Blu-ray. This review covers the Ultra version. If $100 is too rich for your budget, you can sign up for a subscription plan that costs $15 every three months or $45 every year. One of PowerDVD’s greatest strengths is its ability to play or display just about any common video, music, and image files, as well as many of the more esoteric ones (such as APE audio). It’s also a pretty fair librarian. You wouldn’t be far off in thinking of PowerDVD as Windows Media Player on steroids. 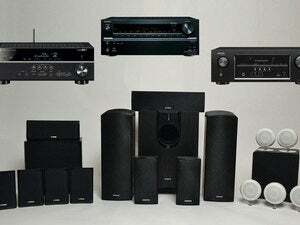 Other major features include playback via DLNA, the ability to decode most surround-sound audio formats (Dolby TrueHD and DTS-HD Master Audio, but not Dolby Atmos or DTS:X), a 10-foot user interface that can be controlled with a remote, and integrated access to online services such as Vimeo and YouTube. You can browse those services without ever opening a browser, and you can even extract the audio, or “pin” a video for offline playback. Cyberlink did a nice job updating the full-screen, 10-foot interface. It’s easy to navigate, the functionality is logically laid out, and you can switch back to “PC Mode” anytime you like. Beyond that, it’s much like any other interface you use with a remote control. Speaking of which, a free remote app is available for both Android and iOS smartphones and tablets. Logical, that. PowerDVD 16 (TV mode shown) interfaces with online services and even lets you “pin” videos for offline viewing. I have a long-standing request in with Cyberlink for something along the lines of Windows Media Player's SRS TruBass and Wow, which are psychoacoustic enhancements that deliver fuller bass response and a sense of spaciousness. They're highly addictive effects when applied to older material, and they're the reason I still use WMP for music playback. I’d also like to see PowerDVD support DirectShow, so users can add their own decoders. More creative video filters, such as those found in Cyberlink’s own ColorDirector, might be fun, too. Hey, some reviewers are just never satisfied. 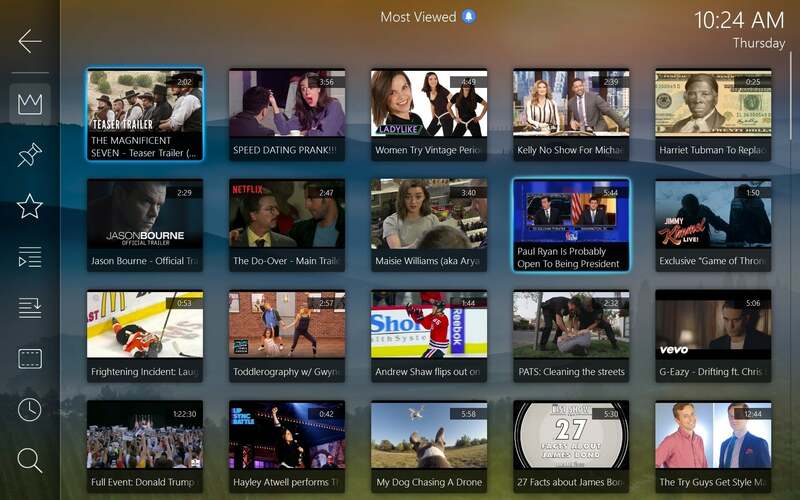 If you're using your PC as a home or dorm-room entertainment center, the latest iteration of PowerDVD’s 10-foot user interface is a super handy. You might find that media casting to a streaming box is, too; but those devices are already so laden with options that I consider that feature that I find it to be one of PowerDVD's less-compelling features. Beyond that, I’d stick with the every-other-iteration strategy. Two full PowerDVD updates seem to be what it takes to accrue enough features to warrant another $50 expenditure in my book. In other words, upgrade from 14, but wait a while if you have 15. Unless of course, you really want what’s new. Then all bets are off. The buying decision is an easier one. 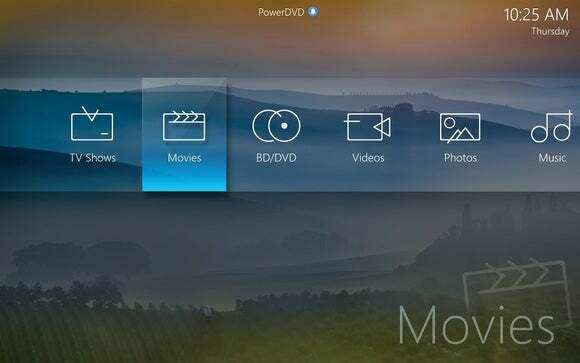 If you want to play Blu-ray discs on your computer, or desire the absolute best video-playback quality, then yes, PowerDVD is what you’re looking for. If you want an easy way to get the content you download to your PC to your TV via a streaming box, same deal. Beyond that, there’s good enough, which is what most of the free players offer you. 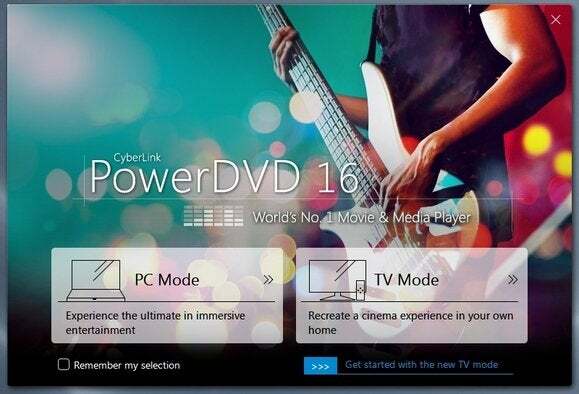 PowerDVD 16 is the most powerful software video and media player available, with more features and video enhancements than you can shake a stick at. As of July 2016, the ability to play 360 degree video was added.